Developed for harsh lighting environments, this attractive anodized aluminum housing allow the mounting of our popular Night Axe™ LED tube light to nearly any flat surface. This streamlined, waterproof design is available in 9″ – 63″ lengths and was developed to deflect impacts and provide protection from harmful elements. 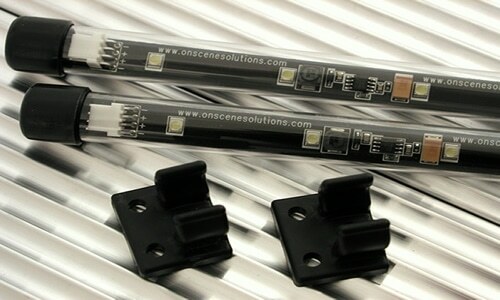 Each assembly comes complete with oneNight Axe™ LED tube light, wire grommets and stainless steel fasteners and is available with a light head mounted switching option. 9", 18", 27", 36", 45", 54", 63"